Ben is the youngest and most successful thief in the royal city of Quadrivium, but an unexpected encounter with Bella, the queen’s mother, changes his life forever. 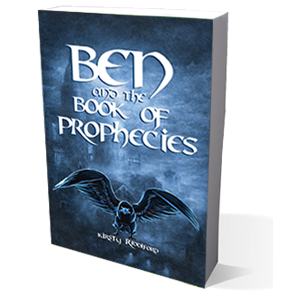 In return for a substantial reward, Ben agrees to track down the Book of Prophecies which disappeared from the palace library many years before. It is believed that the Book contains a prophecy which will save the kingdom from an impending war with the rebels. Yet Bella also has an ulterior motive, to find her son who went missing whilst searching for the same book. Ben finds himself catapulted into an unfamiliar world of magic and intrigue where talking eagles and mythical creatures help him on his quest. During his travels he unearths dark secrets as lives are put in peril and an unforeseen reunion surfaces. But not everyone wants the book to be found. Kirsty Riddiford lives in South West London with her husband and her Labrador, Toby, who features – under the pseudonym Tobias – in her first fantasy series, The Prophecies of Ballitor, published by HandE. She is a member of her local writers group in Putney.